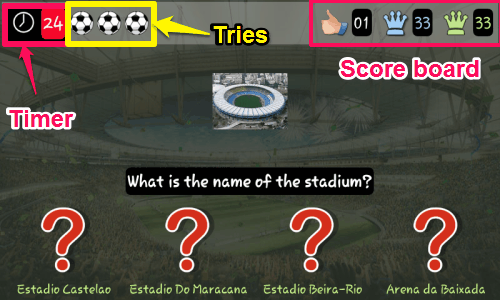 World Cup Trivia 2014 is a free Android game that lets you test your knowledge about FIFA World Cup 2014 and check how much you know about the players, flags, stadiums, etc.. This FIFA trivia game for Android asks you various types of questions related to players, groups, flags, stadiums, and more, so that you can test and enhance your knowledge in a playful manner. When you play this game, you have three lives (or three tries). When you give one wrong answer, you lose a try. When you lose all the tries or all the lives, game ends. The questions are multiple choice type questions, with four choices given with each question. You have to select correct answer from those. It gives you three tries in each game and for each question it gives you 30 seconds to answer. If you choose for the correct answer, it adds up points to your scoreboard and if your chosen answer turns out to be incorrect, then your try gets deducted. The game has a paid option as well, which gives you three additional tries. The best part of this FIFA 2014 is that the game never ends until your three tries are over. 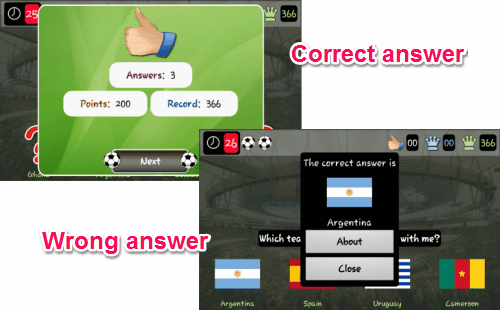 You can easily track the number of correct answers you’ve given while playing the football quiz game. Checkout free websites to check live footballs scores. World Cup Trivia 2014 is developed by the makers of Whistle Camera (we interviewed them here; pretty interesting interview :) ). 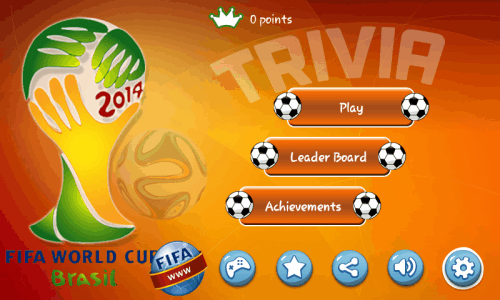 World Cup Trivia 2014 can be installed on your Android phone from the link provided at the end of this review. To check your football knowledge, you need to tap on the Play button. As soon as you tap on it, it opens a question in front you that can be to identify flag, position of the player, group stadium, and many others. As soon as the question opens up in front of you, the timer of 30 seconds begins. It provides you three tries per game that gets deducted when your answer is wrong or when you’re not able to answer any question within the given time of 30 seconds. 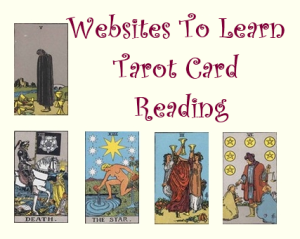 With each question, it provides four choices, from which you have to choose the correct one. In case your chosen answer turns out to be incorrect, then you lose one try per incorrect answer. It gives a thumbs up when your answer is correct, and when your answer is incorrect, it deducts your try displaying the correct answer, so that you don’t make the same mistake next time. The points that you get for each correct answer depend on how much time you take to answer the question; lesser the time, more the points. 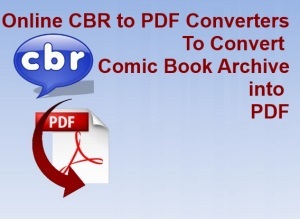 So, try to answer the question as soon as possible. You can track the number of correct answers, tries, current score, and your highest score on the topmost side of the screen. Shows a flag, asks you to identify which country it belongs to. Shows a photo of player, asks you to tell the field position of the player in the football ground. Shows a photo of stadium, asks you to identify which stadium is that. Displays a country name along with its flag and asks you to identify to which group it belongs to. The series of questions continue until your tries are over. 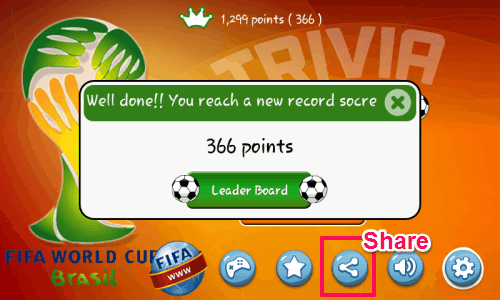 You can answer unlimited questions within a game, that helps in setting new score record. The game also provides nice background sound, which can be enabled or disabled. This record board (leader board) can be shared with your friends so that you can challenge them to beat your score. If you want to follow FIFA news and scores, you can get apps for iPhone, Android, and even Chrome. 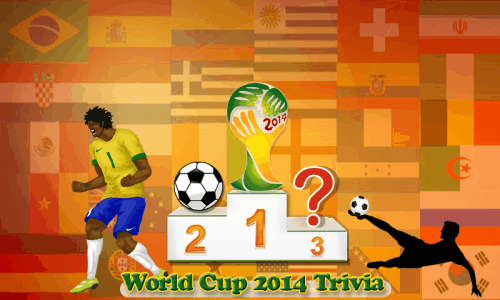 World Cup Trivia 2014 is a quite interesting Android game that helps in developing your knowledge about FIFA World Cup 2014.